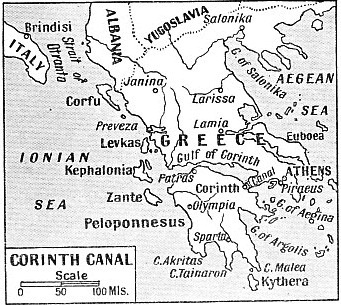 BEGUN IN AD 67 BY THE ROMAN EMPEROR NERO but not completed until 1893, the Corinth Canal considerably shortened communications in the Mediterranean and converted the Gulf of Corinth into a thoroughfare. The length of the canal is 6,939 yards, or just under four miles. Its relatively narrow width (25 yards) makes it impracticable for vessels to pass one another. The ship illustrated is HMS Duncan, leading the First Destroyer Flotilla through the canal. The Duncan, launched in 1932, has a displacement of 1,400 tons, a length between perpendiculars of 317 ft 9 in, a beam of 33 feet, and a draught of 8 ft 8 in. She has just passed under the bridge that carries the railway between Athens and the Peloponnesos..
TWO long peninsulas extend southward from the continent of Europe into the Mediterranean, dividing that sea, on its northern side, into three unequal sections. The more westerly peninsula is Italy, the more easterly the Balkan Peninsula, ending in Greece. A glance at the map of Europe will show that the northern part of Greece is almost divided from its southern extremity - the Peloponnesus - by the Gulf of Corinth. The Gulf of Corinth is an eastward extension of the Ionian Sea and is about eighty miles long and from two to twenty miles broad. Almost at the eastern end of the gulf the Isthmus of Corinth unites the Peloponnesus with northern Greece. The Isthmus of Corinth is a tract of limestone rock less than four miles across at its narrowest and ten miles across at its widest. Its length is about ten miles and its orientation northeast to south-west. On its northern, or rather northwestern side, in the Bay of Corinth - an extension of the gulf of that name - lies the city of Corinth, famed in antiquity for the wealth of its merchants and for the devotion of its priestesses. Not far away from the ruins of the ancient city is the modern town of New Corinth, subject to disconcerting earthquakes. On the south-eastern side of the isthmus is a bay of the Gulf of Aegina, which gives access to the Piraeus, the port of Athens. The central part of the isthmus is a tableland, about 260 feet above the sea at its lowest point. On the southern side it shelves to the sea in steep terraces. The surface of the isthmus is waterless and mainly barren. The only vegetation consists of dwarf pines, shrubs and thistles, supplemented in spring by some apologetic patches of grass which disappear in the hot summer sun. Where soil exists it is cultivated with difficulty and yields scanty and reluctant crops of wheat and barley. On the isthmus were anciently held the Isthmian Games, one of the four major festivals of Greece. The other famous festivals were the Olympic Games at Olympia, the Nemean Games at Nemea and the Pythian Games at Delphi. Olympia lies on the River Alpheus, on the western side of the Peloponnesus. Nemea is on the eastern side of the peninsula. Delphi is in northern Greece, and was regarded by the ancient Greeks as the centre of the world. The idea of cutting a canal through the low-lying isthmus was entertained in remote antiquity. Its object was to avoid the dangers of the voyage round the Peloponnesus. At the south of the peninsula are three capes which have always been dangerous to shipping. The easternmost - Cape Malea - appears to have been, in miniature, a European counterpart of Cape Horn. An ancient Greek proverb said “After doubling Cape Malea forget your family”. The sailors of ancient Greece - and their successors for many generations - seldom ventured out of sight of land. For them the hazards of the Peloponnesian capes were even more real than they would have been for mariners keeping well away from dangerous coasts. To the Greek sailor, therefore, the slender Isthmus of Corinth was a tantalizing barrier. As there was no canal, vessels wishing to pass by sea from the Gulf of Corinth to the Aegean or vice versa had almost to circumnavigate the Peloponnesus and run the gauntlet of its three capes. But there was an alternative; that was to drag the ships across the four miles of the isthmus. The ships of antiquity were not too big to make such a measure impracticable. The labour of dragging these vessels across the isthmus was far preferable to the dangerous sea-passage, and Capes Malea, Tamaron and Akritas would thus be short-circuited. Thus there came into existence the Diolkos, or portage, across the Isthmus of Corinth. Those who are familiar with pleasure-boating on the Thames have doubtless made frequent use of portages at various locks on the river. At these portages light craft are taken over rollers. A similar idea, on a gigantic scale, was the basis of the ambitious but abortive proposal, before the Panama Canal was cut, to build a “ship railway” across the Isthmus of Panama. This “ship railway” was to have carried ocean-going vessels between the Atlantic and the Pacific Oceans. The Isthmian Diolkos began at Schoenus, near the modern Kalamaki, in the Gulf of Aegina, and probably ended, in the Bay of Corinth, at a point near the northwestern end of the present canal. The Diolkos - which takes its name from a Greek word meaning “to pull across” - appears to have been an ancient tramway. 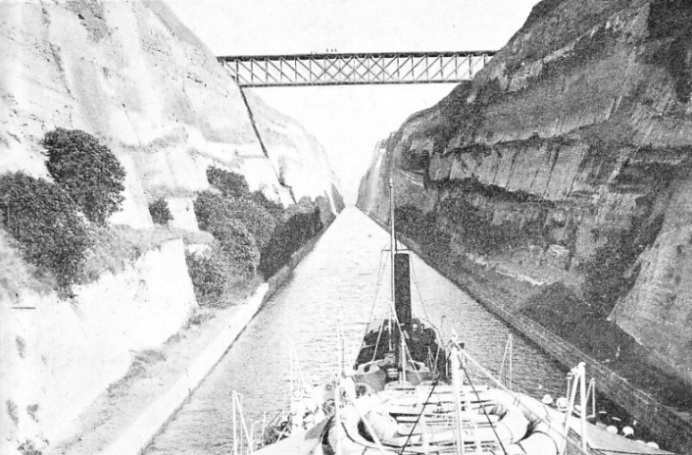 MEDITERRANEAN COMMUNICATIONS were considerably simplified by the opening of the Corinth Canal in November 1893. Ships of moderate dimensions from Brindisi and other Adriatic ports bound for the Piraeus and the Aegean no longer had to round the three notorious capes south of the Peloponnesus, Capes Akritas Tainaron and Malea. It was used by men-of-war as well as by merchant vessels. We are told by the Greek historian Thucydides that warships were dragged across the Isthmus of Corinth during the Peloponnesian War (431-404 BC). In the civil war between Octavius (later the Roman Emperor Augustus) and Mark Antony, Octavius, pursuing his defeated enemy, had his ships conveyed across the isthmus. This occurred after the battle of Actium, which took place in 31 BC, off a promontory on the Acarnanian coast, north of the entrance to the Gulf of Corinth. From portage to canal was an obvious step. One of the earliest rulers to contemplate the cutting of a canal was Periander, Tyrant - or, as we should call him to-day, Dictator - of Corinth. He reigned from 625 to 585 BC. The Corinthian tyrant anticipated by over a hundred years the resourcefulness of Xerxes (see pages 913-919), who cut a canal in a different part of Greece when he invaded Europe in 481-480 BC. The canal of Xerxes was cut across the peninsula of Athos, and its construction was due to the Persian king’s concern for the safety of his fleet. It had no commercial significance. Periander was presumably one of the most enlightened rulers of antiquity, for he was counted among the Seven Sages. His plan, however, for all his sagacity, did not proceed beyond the drawing-board. Had it done so, it would have greatly increased the commercial importance of Corinth, whose harbours, on either side of the isthmus, would thus have been connected. The idea of a canal across the Isthmus of Corinth occurred also over three centuries later to the famous soldier Demetrius Poliorcetes (“the Besieger”), sometime King of Macedon. Demetrius, who lived from 337 to 282 BC, was a son of Antigonus, one of Alexander the Great’s generals. But the real credit for beginning operations on the canal is due to the Roman Emperor Nero, who reigned from AD 54 to 68. Nero is usually regarded as the monster who used incandescent criminals to light his garden walks at night and as the decadent who fiddled while Rome burned. But his work at Corinth, though unfortunately uncompleted, bade fair to be of great public utility. The emperor inaugurated the work on the canal with great pomp in the year 67, one year before his death. At that time the whole of Greece formed part of the Roman Empire. Nero cut the first sod with a gold spade. Loss than half a mile, however, had been accomplished when the work had to be suspended because of an insurrection in Gaul. The line of the canal begun by Nero was so well planned that it was adopted by the builders of the modern canal. In consequence the traces of the original works have been obliterated. To provide labour for this great undertaking, the general Vespasian - who became Roman Emperor in AD 69, immediately after the year of the three Emperors Galba, Otho and Vitellius - sent 6,000 Jewish prisoners. Work was begun at several points. The various trenches had a depth of from 10 to 100 feet and a width of from 40 to 55 feet. Over 650,000 cubic yards are said to have been excavated in the three or four months that the operations lasted. In 1829, towards the end of the War of Greek Independence, plans were made for the cutting of a canal, but the country had to wait over fifty years before anything more was done. In 1881 the isthmus was surveyed, and on May 4, 1882, King George I of Greece, brother of Queen Alexandra, following the example of the Roman Emperor eighteen centuries before, made the first cut. The canal was opened for the passage of ships in November 1893. The work was begun by a French company and completed by a Greek company. The length of the canal is 6,937 yards, or just under four miles; its width at the bottom is 25 yards and the depth of the water is 26 feet. The canal, which runs in a straight line across the isthmus, has no locks. It is protected, at its north-western end, by two breakwaters 262 yards long, which enclose the port of Poseidonia. Similar breakwaters are provided at Isthmia at the other end. On the breakwaters are lighthouses. Vessels have to wait for a clear road, as no passing is allowed in the canal. STRAIGHT THROUGH THE ISTHMUS OF CORINTH, the canal cutting extends for nearly four miles, with no locks and no curves. The Corinth Canal is therefore more striking than many larger canals because it is possible to see from the Gulf of Aegina to the Gulf of Corinth through a cutting made by man The canal is used by many Mediterranean passenger vessels, warships and smaller craft for it shortens the distance from the Adriatic to the Piraeus, the port of Athens, by 185 nautical miles. The absence of locks has necessitated extensive excavation. Towards the middle of the canal the cutting has a maximum depth of 260 feet. The slope of the sides is 10 in 1. Thus passengers in a ship passing through the canal have no view of the surrounding country. The Piraeus-Athens-Peloponnesus Railway from Athens to Corinth crosses the canal on a bridge 101 yards long and 144 feet above the level of the water. At either end of the canal are ferries for vehicles and foot-passengers. The strength of the current in the canal is from 1 to 3 knots. Great care is necessary to prevent the ships from bumping against the sides. The maximum permissible speed in the canal is 6 knots. Ships are sometimes assisted by tugs through the canal. The Corinth Canal has shortened the distance between the Adriatic and the Piraeus by 185 nautical miles. Ships coming from Marseilles, Genoa or Naples save ninety-five nautical miles. Among the steamship and motorship lines using the Corinth Canal to-day are those linking the Adriatic with the port of Athens. The Lloyd Triestino, in co-operation with the Adriatica line, has an express service between Trieste and the Piraeus and between Venice and Istanbul (Constantinople). Either service includes a call at Brindisi, near the southern end of the Adriatic, on the Strait of Otranto. The passage between Brindisi and the Piraeus, through the Gulf of Corinth and the Corinth Canal, takes from twenty-four to thirty hours. No intermediate stops for passengers are made. These services are operated by the Adriatica motorships Rodi (3,220 tons gross) and Gitta di Bari (3,220 tons gross). The Adriatic-Syrian Line between Trieste and Beirut, Syria, similarly uses the Corinth Canal. Between Brindisi and the Piraeus a call is made at Patras, the most important port in the Peloponnesus and the third largest port in Greece (after the Piraeus and Salonika). Some of the Trieste Lloyd vessels, in addition to visiting Patras, call at the little Albanian port of Santi Quaranta (“Forty Saints”), opposite Corfu, and at Corfu. The Italian Adriatica line has a service between Venice and Izmir (Smyrna) which uses the canal, and another between Venice and the Piraeus serving Dalmatian ports. Of the Greek lines using the Corinth Canal, theHellenicCoastLines have a service between Brindisi, Corfu and Crete. The Greek National Steam Navigation Co. has a service operated by the steamer Andros (2,068 tons gross) between Marseilles, ithe Piraeus and Beirut through the Corinth Canal. Another line using the Corinth Canal is the Yugoslav Jadranska Steamship Company, with its service between Susak or Trieste and the Piraeus. The steamers normally operating this service are the Beograd (864 tons gross) and the Srbin (982 tons gross). They call at various ports on the Dalmatian coast, and then at Santi Quaranta and Corfu. Calls are made also at Levkas, Patras and Vostiza (Aegion). The largest vessels using the Corinth Canal, whether they are Italian, Greek or Yugoslav, have, as a rule, a gross tonnage not greatly exceeding 3,000. The Adriatica Line has two motorships of about 3,300 tons gross - the Pierro Foscari and the Filipo Grimani. The Greek and Yugoslav vessels are smaller. 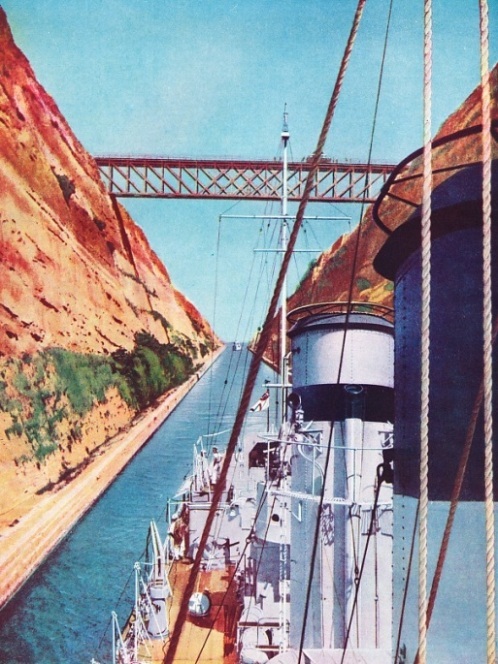 In addition to merchant ships, moderate-sized warships of various nationalities are allowed, in normal circumstances, to go through the Corinth Canal. Destroyers of the British Navy are not infrequent visitors, and cruisers of the “C” class can negotiate the passage. The “C” class cruisers have a displacement of 4,200-4,290 tons. CUT THROUGH SOLID ROCK to a depth of 260 feet at its deepest point, the Corinth Canal is crossed by only one bridge. This bridge carries the railway between Athens and Corinth. The bridge is 101 yards long and 144 feet above the water. This photograph was taken from HMS Curacoa, a cruiser of 4.290 tons displacement She is being assisted by a tug because of the difficulty of steering a vessel of this size in such confined waters. The canal is 25 yards wide at the bottom and has a depth of 26 feet.